In an effort to avoid a “debt trap,” Prime Minister Ranil Wickremesinghe in a special statement to Parliament yesterday revamped several taxes including the Value Added Tax (VAT) and reintroduced the Capital Gains Tax to revise Budget 2016 and keep deficit and debt controlled. The seven-page statement slammed the previous Government of former President Mahinda Rajapaksa for concealing debt accumulated by State-Owned Enterprises and other public companies, which had to be added to the consolidated fund by the Wickremesinghe-Sirisena administration. The Prime Minister also outlined how the new Government decided to allow a forensic audit by the International Monetary Fund (IMF) ahead of a possible program between the two entities to increase fiscal consolidation. A new tax system likely to be implemented in 2017 is also under discussion between the Government and the IMF. Under the new measures Wickremesinghe announced that VAT would be hiked to 15% from 11%, while capital gains would be taxed for the first time since 1987. However, he insisted VAT increases would not be imposed on electricity bills and essential goods. The new tax rates were decided at a special Cabinet meeting over the weekend where VAT exemptions to telecommunications, private education and the health sector among others was ruled out to simplify the system. 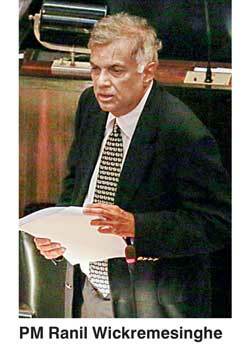 Wickremesinghe told Parliament the Government owed Rs. 9.5 trillion ($65.6 billion) or 74.9% of GDP, as he revised some of the main Budget numbers presented in November. He noted the former Government headed by Rajapaksa had not included Rs. 1.04 trillion in borrowing by State enterprises in the national debt, which was estimated at Rs. 8.48 trillion at the end of last year. The Prime Minister, also the Minister of Policy Planning and Economic Development, said the country has to pay Rs. 1.21 trillion on its debts this year, including Rs. 562 billion in interest. “The Ceylon Petroleum Corporation is in Rs. 365 billion of debt, Sri Lanka Ports Authority (SLPA) owes Rs. 260 billion and SriLankan Airlines Rs. 211 billion. The list is very long. The amount of debt might increase, it might even hit Rs. 10 trillion,” the Prime Minister warned lawmakers. The Sri Lanka Transport Board (SLTB) has failed to pay Rs. 23 billion of provident funds to its employees while Government departments and ministries have tacked up debt of Rs. 58.4 billion. The Highways Ministry alone is Rs. 24 billion in debt, stated Wickremesinghe, slamming the previous Government on its infrastructure development policies. Sri Lanka’s finances are under scrutiny after ratings agency Fitch last week downgraded its sovereign rating by a notch to “B+”, spurred by a ballooning fiscal deficit, rising foreign debt and sluggish growth prospects that have been highlighted numerous times by economists. The country also faces a balance-of-payments crisis after a third of its foreign exchange reserves were depleted within the 15 months to January by the Central Bank’s defence of the rupee currency, pressured by heavy debt piled up under the previous Government, Reuters reported. 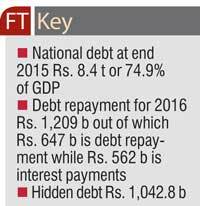 “This crisis can be overcome only by reducing the budget deficit and a medium-term joint financial program aiming at suitable reforms to reduce the debt burden,” Wickremesinghe told lawmakers. However, Wickremesinghe defended the tax increases by outlining positives of the liberal economic policies undertaken by his Government. Regaining the GSP+ and the conclusion of trade negotiations with major economies including India and China will boost local exports and strengthen earnings, he assured.